This release extends the sidebar with two new sidebar widgets: “Tag Palette” and “Filter“. 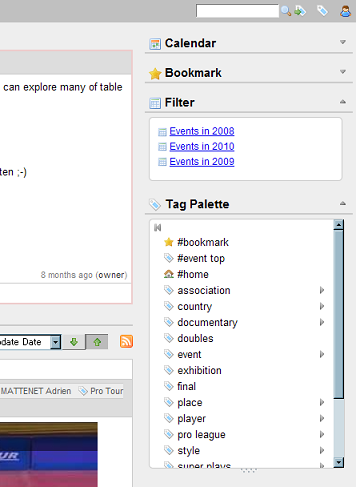 The Tag Palette in the sidebar has the same features as the existing pull-down Tag Palette on the main menu bar, also supporting drag-and-drop tagging. As a result of this addition, the sidebar now has all the basic quick accesses to fragments: “Bookmark”, “Filter”, “Tag Palette” and “Recently Viewed”. Because of the increased number of sidebar widgets, a show/hide toggle button has been added to each widget to allow users to fold (“hide”) unnecessary widgets. Hi, Piggydb is very cool… my question… Exists a version with other db? for example oracle? Hi Antonio, thanks for your comment. Currently, external databases are not supported. Piggydb uses JDBC, so it could support other databases such as Oracle, but some features cannot be ported without rewriting the code.